Bailey passed away in her sleep early Christmas morning. She looked very peaceful and comfortable. I guess taking the final decision away from us was her Christmas gift to us. 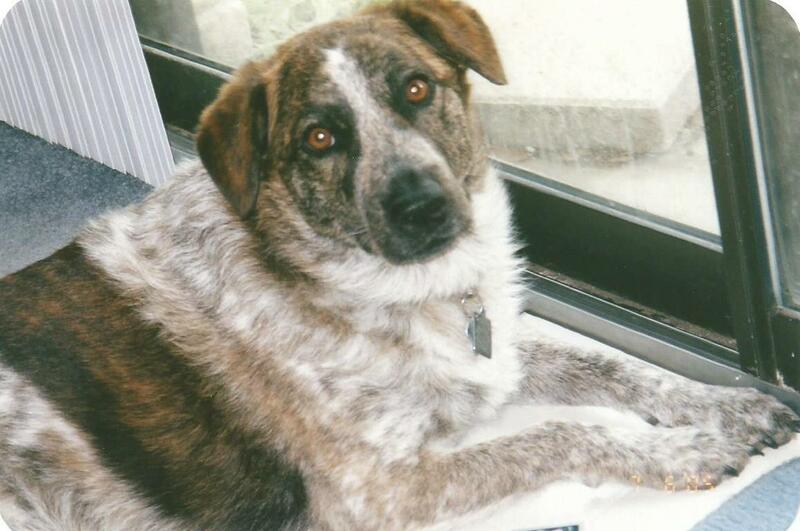 In order to honor this member of our family who has been a trusted friend, confidant, protector, and companion to all four of us for the last twelve-and-a-half years, please allow me to share her story and pictures. 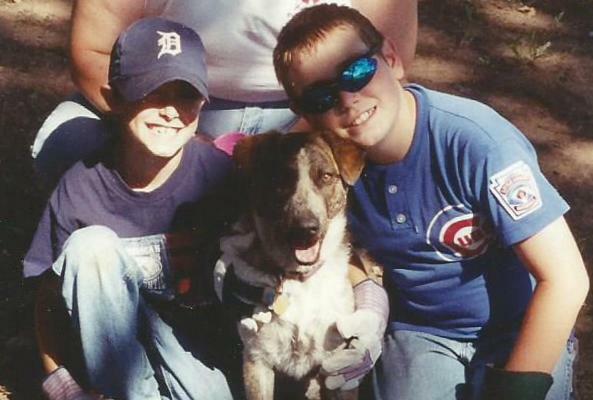 In June of 2002 our family started talking about getting a dog. Phillip was ten, Chuck was almost eight, and we had plenty of room, time, energy, and love to share. We were committed to rescuing a puppy, and providing a forever home. Steve and I had experience with Heelers, and after doing additional research decided a Heeler puppy would be a good fit for our family. No sooner than we had made that decision than I saw a flier in the locker room at work. 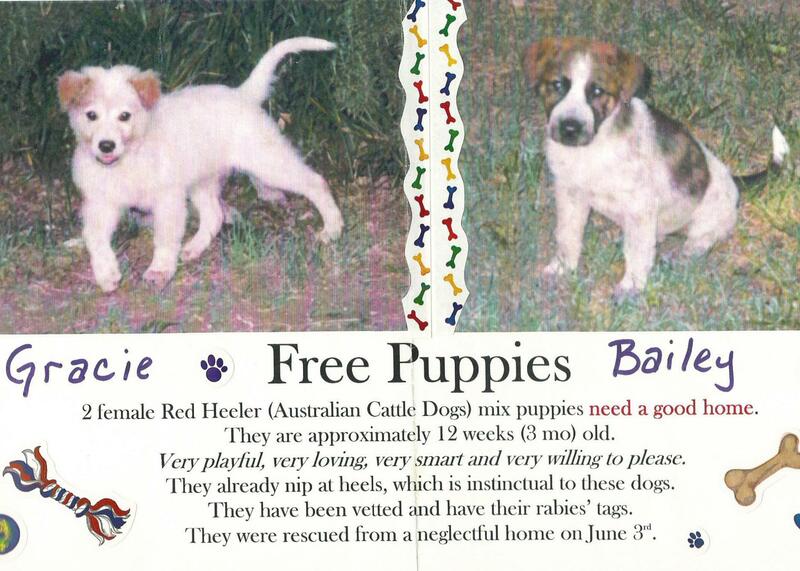 Two Heeler-mix puppies had been rescued in SW Dallas and were ready for adoption. These sweet girls had been found at about six weeks old, digging for food in a trash can, covered in fleas, and suffering from malnutrition and mange. Thankfully they were found by a generous lady who, with some friends, took them to the vet, had them treated, and got all their vaccinations current. We went to look at them the end of June. Both pups were adorable. Their rescuer was calling them Blondie and Brownie. Although either pup would have been a great fit for our family, we were all more drawn to “Brownie” for some reason. Knowing we were planning to be out of town for the Fourth of July holiday, we asked to have some time to think about it. She told us to call her when we returned home with our decision. After our trip, we bought bowls, a crate, leash, collar, food, and went and picked her up. We got her home and christened her Bailey. The pups’ benefactor chose to keep “Blondie,” and gave her the permanent name of Gracie. The sisters have seen each other a couple times, and we keep up with Gracie through e-mail and Facebook. Bailey has brought joy to us in so many ways. The boys poured out their hearts to her. She woke me during the nights when they were sick. She loved hiking through the woods and nature preserves with us, and running alongside Phillip’s bike. She enjoyed the snow which is a very rare occurrence in North Texas. She accompanied us camping and visiting Steve’s parents’ cattle ranch. She was truly a Heeler, and could instinctively take down a difficult bull or cut a calf or heifer from the herd. It was a joy to watch her run through the hay fields and pastures—often all we could see of her was the white tip of her tail flying above the green grasses like a flag. Although we thought we would be taking care of a rescue, she has also taken care of us during the years. When a burglar tried to break in our house while we were gone she fended him off, and was kicked and had her hip injured in the process. When vandals set my husband’s truck on fire during the wee hours, she woke me up in time to call 911 and save not only the truck but our home. When I had a stroke while home alone, I fell and hit my head, knocking myself unconscious and bleeding everywhere, Bailey stayed by my side pawing and licking me and rolling me over. When Phillip came home from school, he found both Bailey and me covered in blood. EMT’s said she probably saved my life. For these big examples and innumerable small ones, Bailey has more than earned her kibble and our devotion. 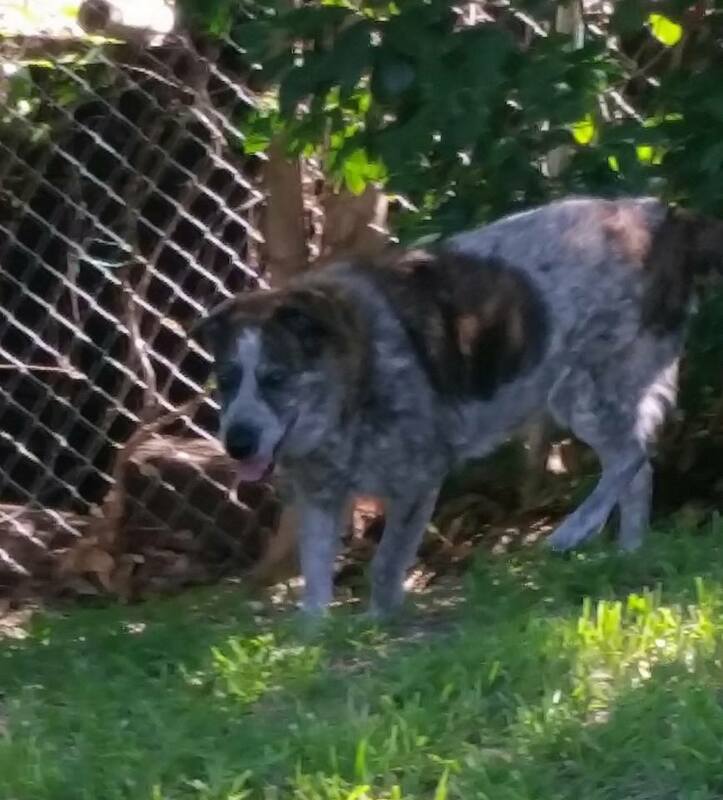 Like most Heelers, Bailey was dedicated to her humans. She liked to work hard and play hard. She didn’t necessarily like or need other dogs or people in her world, and could be aggressive if she fe lt any of her family was threatened. She never had pups of her own, and was extremely gentle and careful with other puppies and kittens. Almost four years ago, we decided I needed more help than she could provide, and we started the process of training and partnering me with a service dog. Gizmo was eight weeks old when she met him, and for almost four years she has loved, disciplined, and played with him. While Gizmo went everywhere with me, Bailey remained the alpha-dog at home. When we moved from our home into an apartment, we were nervous about her adjustment. She did well, although she still didn’t like playing with other dogs, but as long as other dogs were nice to Gizmo, she let them be. We learned last summer (2013), while in the process of moving, that Bailey was dealing with chronic liver failure. She was responding well to the treatment, and continued to seem happy and healthy until about six weeks ago. She became much more lethargic, didn’t want to be petted or touched anywhere on her head. Then before Thanksgiving one side of her forehead swelled and she started having nosebleeds. We learned then that she had bone cancer and it was in her skull and a front leg. We treated her with steroids and antibiotics and she responded really well. Within a couple days the swelling subsided and she started acting like her old happy self. But we knew that there is no cure for bone cancer and she would soon get worse. We started planning for the end, and tried to determine when would be the best time to put her down as we wanted to get every possible minute with her, yet we didn’t want her to suffer on our account. Bailey relieved us of that responsibility. We woke up with big plans for Christmas morning only to find she had died in her sleep. She was in her favorite spot and position on the floor next to my side of the bed. At first we just thought she was asleep, as she looked so normal and peaceful. Gizmo sat and watched over her, as he had been doing the last few weeks, while we figured out what to do. Since all vets and animal services were closed for Christmas day, we had to take care of her final arrangements ourselves. With the advice and help of family and friends, we found a lovely spot in the woods to bury her. Thank you for being part of the McClatchy family for almost thirteen years, Miss Bailey. You will be remembered and missed. A beautiful tribute to an exceptional dog.